Aeroplanes could be far better for the environment, create less noise and be safer for passengers thanks to new software developed by a University of Manchester academic. Currently, airlines underestimate the amount of dangerous CO2 emissions they release in the atmosphere by up to 100% – meaning their aircraft are actually far more harmful than previously thought. Now new software, called FLIGHT, can expertly predict the true level of emissions released and help the industry improve their environmental reputation – one of the issues about which they are most criticised. The software, developed by Dr Antonio Filippone, can be easily downloaded from a website by airline companies. While the potential to reduce emissions is arguably the most important uses of FLIGHT, it has a range of other functions from noise reduction to accident investigation and prevention. Noise around airports is a huge issue, and FLIGHT can help air traffic controllers and airline authorities determine the best flight path for incoming and outgoing planes by providing exact measurements of noise given off on take –off and landing. The software can also help airline companies with passenger load and the weight of luggage. Software copyright protection was arranged by The University of Manchester’s intellectual property commercialisation company, UMIP. Another key function of FLIGHT is its role in accident investigation and prevention. Dr Filippone used FLIGHT to analyse the Boeing 777 which crashed at Heathrow in January 2008. The accident was caused by freezing of the valves which take the fuel into the engine. 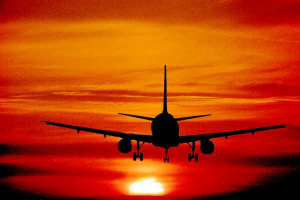 Dr Filippone, from the School of Mechanical, Aerospace and Civil Engineering, said the carbon emission estimates currently provided by the airline industry are far from realistic. He added: “These estimates do not account for factors such as climb and descent, and do not account for the actual aircraft load, as well as items including on-board services and bulk cargo. “This is the method used to calculate the cost of the carbon that sometimes is added voluntarily to the cost of the travel tickets. “Some stock markets have started trading carbon credits as ordinary commodities. It is recognised that a carbon trading scheme will have a huge impact on the profitability of the airlines. “If an accurate method of calculating these emissions becomes available, the entire business will become more transparent. “FLIGHT can optimise the airplane trajectories for minimum fuel consumption and can determine flight paths that avoid or minimise contrail formation. “We can already very well map the noise aircraft will make from the ground, from geographical constraints like built-up areas, mountains and so on. “But we can now look at real noise around airports. This can be used to reduce noise by altering flight paths. “We can also compare one aircraft against another. This is the most impartial way of doing this, as individual companies have the means to do this but will always favour their own products.